Josh Cole is Design & Creative Director at Rye Pottery, which he runs alongside his sister Tabby. Overseeing Design alongside our manufacturing processes, Josh’s role is critical in ensuring creative integrity is maintained and marries perfectly with production. Combining strong practical & theoretical pottery skills with an astute eye for form, function and style, Josh is Rye Pottery’s lead Designer. With a fiercely design-led upbringing & careers in the Creative Industries (Stage, Screen & Retail and Journalism/TV & Film respectively) Josh & Tabby share a passion and respect for quality craftsmanship and high-end design. The siblings stepped in tentatively, and potentially temporarily, at the Pottery in 2012 when their father Quin had a heart scare and all hands were needed. As the months wore on, they decided to return to their first creative love – clay and pots. In 2013 Biddy & Quin formally handed over the reigns of the business. They’re thrilled to be the third generation to run the family firm. Tarquin “Quin” Cole with wife Biddy took over the running of Rye Pottery from Quin’s father Wally in 1978. He was the company’s Creative & Design Director until 2013. With his exacting eye, Quin oversaw all creative elements of the business, expertly commissioning & guiding each new figure, line and special commission from initial concept through to full production. Alongside his collaborative work with all our designers (see below) many lines & specific pieces have been designed by him, or stem from one of his original ideas, including several pieces in the Pastoral Collection plus a host of special commissions & commemorative lines. Quin trained in ceramics at The Royal College of Art, where his tutors included John Skeaping. On graduation he taught – among other things – Industrial Design at various Art schools, including Camberwell. He was also drafted in by renowned British painter John Nash to join the fledgling Botannical Illustration teaching staff at the now renowned Field Studies Centre at Flatford Mill in Suffolk. Bursting with youthful energy, Quin also set up his own design studio – Ceramic Consultants Ltd – working as a bridge between architects and the building industry. His pioneering use of Ceramics earned him a host of high-profile commissions and his first prestigious Design Award, which was also the first ever for a Scottish Company – Govancroft – in 1966. His early commissions included 1960’s and 70’s buildings such as Warwick University, Manchester Magistrates Court and St Thomas’s Hospital, all of which pioneered the use of plain white glazed tiles as external wall cladding. This passion for architectural ceramics developed into designing murals for many public buildings both at home and abroad, while frustration with the ever dwindling number of English manufacturers led to the start of Rye Tiles in 1966. This gave him total control over his own production. Rye Tiles produced hand-painted and screen printed tiles for projects from Bond Street Tube Station to bathrooms at the Ritz, alongside a host of private commissions for leading stars, politicians, musicians, artists, authors and yes, even royalty. Rye Tiles were behind Habitat’s first ever Tile Ranges and also Laura Ashley’s first foray into tiles too. Quin secured his second Design Award for his Blazer and Honeycomb tile designs in 1974. Never losing his interest in and involvement with the family firm meant that in 1978 when his father Wally wanted to retire to concentrate on his own studio pottery and sculpture, Quin & Biddy took over the helm at Rye Pottery. This task coincided with the movement of much pottery manufacture out of Britain, giving consumers a taste for prices that could not be replicated in the UK. Tableware was put on the back burner and new ideas and collections were introduced to keep the business alive. The Canterbury Tales was the first, and thankfully, very successful series introduced and the discovery that the Chaucer Hounds were being sold without the Monk made the Biddy and Quin realise that a range of animals might be another winner! As the managing director of Rye Pottery and Rye Tiles, Biddy oversaw the day-to-day production process as well as heading sales and marketing. Having secured a drama teaching degree from The Central School of Speech & Drama, (where she studied historical costume design) Biddy then embarked on a stint in Fleet Street, culminating in a role writing Restaurant Reviews for the acclaimed Punch magazine. A decision to manufacture their own tile in 1967 saw Biddy finally quit Fleet Street in 1967 to run the business full time. Since that day Biddy has been integral to the creative process at Rye Pottery, working closely with Tarquin. Together they discussed, researched, tweaked and reworked all new figures and designs, sometimes for months or very occasionally years, and always down to the tiniest detail. The result has been a consistent design ethos that pervades each and every figure producing the look and feel that is quintessentially “Rye Pottery”. Brothers Wally & Jack Cole bought and re-opened Rye Pottery in 1947 after WW2. From working class origins in Woolwich the brothers were both hugely driven and passionate about their futures despite the tough economic conditions of the 1930s. Wally went straight from school to Art school studying under sculptor John Skeaping, while older brother Jack trained to teach metal and wood work. When Wally landed a prestigious scholarship to join the sculptor/potters course at The Central School of Art – now Central St Martins – Jack decided to take a sabbatical from teaching and join him. The pre-war period saw the brothers exhibiting in top London Galleries, with their work showing alongside Bernard Leach and Michael Cardew among others. Wally sold to major collectors of the period including Jim Ede (now of Kettles Yard fame) and George Eumorfopoulos and also worked for both Skeaping and sculptor Eric Kennington. When WW2 broke out, Jack continued teaching while Wally secured a commission and spent most of the war in the Camouflage Training and Development Centre at Farnham Castle working as the right-hand man to Britain’s Chief Deception officer James Gardner or “G” as Wally called him. The changing post-war world encouraged a change in direction for both of the Brothers too. Jack was by now headmaster of Beckenham Art School, numbering designer Robin Day and his wife Lucienne among his talented staff, but the brothers also hankered after something else. They discovered an old pottery for sale that had been shut during the war near their favoured holiday haunt of Winchelsea. Encouraged by client and V&A Ceramics chief WB Honey, they re-started production. Things quickly took off and Rye Pottery’s reputation as a major influencer in the Mid Century Design movement took root. Rye Pottery pieces were selected for display in one of the Design Pavilions of the 1951 Festival of Britain (Click here to take a look) and the company swiftly established itself as a cutting edge production pottery stocking the smartest of clients and shops – Heals of London, Tiffany’s in New York and the prestigious Primavera Gallery in Cambridge. The brothers’ unpretentious instinct for form, function & decoration has seen Rye Pottery’s work acclaimed by collectors, authors, galleries, museums & auction houses around the world. A number of Mid Century designs by Rye Pottery (distinct from Wally & Jack’s studio work) are in museums including the V&A and the British Museum’s Geffrye Museum. (Click here to see Rye Pottery in the Geffrye Museum or here to see Rye Pottery at the V&A.). 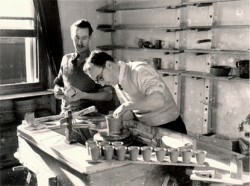 As respected studio potters Wally and Jack also have examples of their pre-war studio pottery in among others the Victoria and Albert Museum. (Click here and also here and here to see their studio work held by the V&A). Tony trained at Wolverhampton Art School & The Royal College of Art. He designed pieces for Royal Copenhagen before starting his teaching career, he recently retired from his post in the Pottery department at Hastings College to concentrate on producing his own commissioned work mainly for sale in galleries here and in the USA. He has designed a wide range of pieces here at Rye over the past 30 years, starting with the very successful Canterbury Tales series, which he researched meticulously finding some of his early inspiration in The Ellesmere Chronicles, later producing many beautifully modelled animals covering both domestic animals like sheep, cows and goats and of course Pigs, as well as some more exotic ones like Cockatoos or Zebras. He is able to convey great movement and strength in all his work for Rye, so that already many of his animals such as the Rye Rabbit are sought after collector items. Tony’s current subject with Rye is The 1066: Bayeux Tapestry, Battle of Hastings series where he is working very closely from the original wonderful Bayeux Tapestry itself with all its humour and detail so suited to both his own and Rye Pottery’s skills and abilities. Neal is a figurative sculptor and potter who trained at Mid Essex Technical College & School of Art before going on to The Royal College of Art for a post-graduate degree. Working at the Royal College at the same time as Quin he studied both sculpture, pottery modelling and ceramic design. He designed, with fellow student David White, The Royal College Shape in bone china, later produced at the Royal Worcester Porcelain Company where he worked as staff designer. In 1960 this range won both a Design Centre Award and The Duke of Edinburgh’s first Prize for Elegant Design. 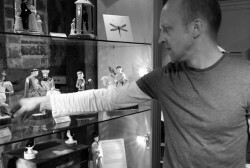 After fourteen years at Worcester, he went into full-time teaching at Hornsey College of Art, remaining as a Consultant at Royal Worcester for 5 years. At Hornsey, later Middlesex Polytechnic, he became Course Leader, Head of School and Deputy Dean, becoming Professor in 1985 and then Emeritus Professor in 1991 following early retirement. Neal has kept his industrial connections by designing figures for Rye Pottery. The Lovers in 1983 completed in 1988 were followed by The American Colonial range and then his Edwardian Country House Gardeners, Cooks and Golfers. With his great love of cricket (Neal’s a keen MCC member) he designed first The Bowler William Lillywhite (a Sussex player) to mark the 250th anniversary of Rye Cricket Club followed by the Rye Batsman – Fuller Pilch of Kent. In 2005 we asked him to to help Rye commemorate the 200th anniversary of the Battle of Trafalgar: Lord Nelson and Lady Emma Hamilton were the elegant result This pair as always, show Neal’s meticulous attention to detail and his intensive care in researching each of his subjects, perhaps the reason he was asked some years ago to model Mrs Thatcher for her old Finchley constituency! Neal continues to design large-scale figures for both exhibitions and as private commissions in stoneware or resin with a bronze finish no doubt these large scale figures provide a good working contrast with the small scale designs he produces for us here at Rye. To look at all the figures Neal has designed for us at Rye Pottery click here, or to find out more about Neal you can visit his own website here. Chris trained at Bournemouth Art College and Poole Pottery. Between them, Quin and Chris O’Donoghue have produced most of Rye Pottery’s Naïve Pastoral Collection. Many of the figures in this series stemmed from ideas Quin had pondered since he was a boy, So he would start by designing the figures with intricately detailed drawings, that Chris would then expertly turn into a clay model . A series of changes and edits again from Quin would ensue until he was happy with the final model. The production of these figures is quite different from commissioning either Tony Bennett or Neal French and these pooled ideas for the Pastoral Rye groups have resulted in some very charming compositions. For example State Occasion was based on a school boy theatre visit when Tarquin sat in the Royal Box and noticed the uniformed flunkey outside having a sneaky glass of sherry during the performance. As these groups develop so does the detail in each one, originally almost plain on the back as in The Hoppickers, all the later pieces have some sort of modelled action happening on the back. The Naïve Nativity has both Joseph and a Shepherd in relief behind the stable, while Mother’s Day has a baby in its cradle plus a black & white cat! Chris though still working with clay and earth has now moved on to landscape garden design. You can visit Chris’ website here. Sculptor and painter Gordon was asked by Canterbury Cathedral to work with Rye Pottery back in the early 1970’s, the result being The Wife of Bath – which is still the best selling figure from The Canterbury Tales series. Gordon was unable to work for us when we decided in 1980 to start expanding the range of Chaucer’s characters, but later on he was able to produce The Rye Nativity with the three Kings and attendant Shepherds for us, we never did manage to get an Angel from him! 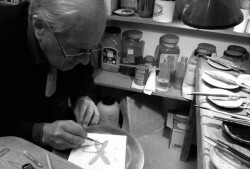 A true Renaissance man, Gordon had the ability to turn his hand to any facet of the creative visual arts, we were indeed fortunate to have him designing for us at Rye. Joan designed Shepherd Neame and his Wife of Sussex as a thank you to Tarquin for helping her at the time of her husband’s death. She also designed the popular Rye Dog and Rye Puppy. Joan and her husband David were known for their range of wonderful dressed papier maché cats. After David’s death Joan produced her cats on a pottery base, each one numbered and signed. Please Note however that these pottery de Bethel cats are NOT connected in any way with Rye Pottery. Wendy designed The Fisherman’s Tale. She was a student at the Royal College of Art with both Tarquin and Neal. She also produced a rather wonderful Europa figure (right) on a large white bull for Rye which we had hoped would become a big seller when we finally joined the EU. Unfortunately, we somehow rather misjudged the enthusiasm of the general UK public for this union! Sadly, Wendy died before Rye was able to commission further figures from her.